Insurgents in Thailand's Muslim-dominated deep south are increasingly targeting civilians in attacks that often amount to war crimes, Amnesty International said Tuesday. The conflict has claimed thousands of lives since 2004 in Thailand's three southernmost provinces, which have been under a state of emergency for the past six years. Amnesty said in a report that almost two-thirds of those killed were civilians, both Muslims and Buddhists, from farmers and religious leader to those with semi-official positions like teachers and civil servants. 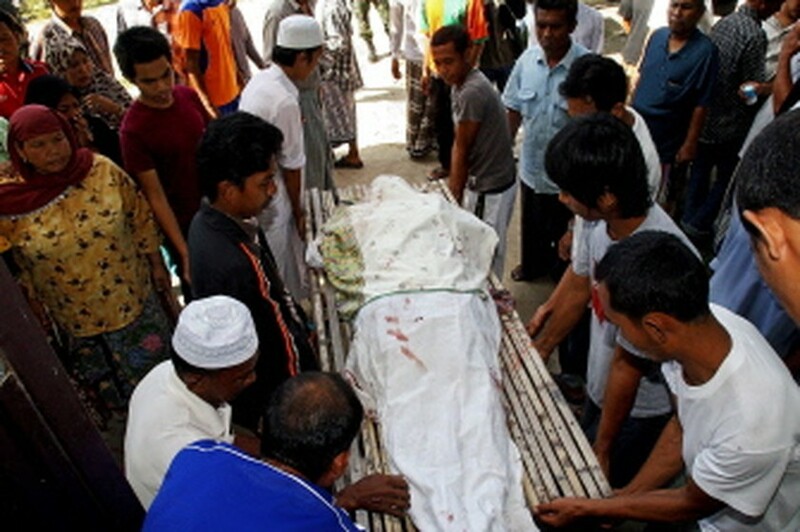 In a file picture taken on June 9, 2009, Thai Muslim villagers remove a victim's body from a mosque in the Cho-i-Rong distrist of Thailand's restive southern province of Narathiwat, a day after gunmen stormed the mosque killing 11 people during evening prayers. The rights group said the war crimes accusation relates to increasing attacks against people taking no active part in what it described as an "internal armed conflict". "Our conclusion is that the purpose of those attacks is to create terror," Amnesty researcher Benjamin Zawacki, the author of the report, said at a press conference in Bangkok. Amnesty urged the insurgents "to immediately cease attacks deliberately targeting civilians, indiscriminate attacks, and other violations of international humanitarian law, many of which constitute war crimes". The report said despite a large military presence in the south, authorities have been "unable to assert and exercise lawful control". "Further, human rights violations by Thai security forces have contributed to the deterioration of safety, security, and protection in the deep south for those taking no active part in hostilities," it added. Authorities have increased the use of village defence volunteers and paramilitaries, and have facilitated a "major proliferation" of small arms in the region, it said. Around 4,800 people have been killed in near-daily attacks since early 2004, according to Deep South Watch, an independent monitoring group. People in the region complain there is discrimination against ethnic Malay Muslims by authorities in the Buddhist-majority nation, including alleged abuses by the armed forces.